The Marin Democratic Party’s endorsement in the Marin County district attorney’s race has taken center stage. The matter was ultimately decided by Marin County Superior Court Judge Roy Chernus, who ruled that the statement, while improper, would be allowed to stand due to a procedural error by the Marin County Registrar of Voters. Now, Pletcher is raising issues about various campaign mailings by Frugoli, which she says make it appear that Frugoli was endorsed by the Democratic Party. At the end of August, the Marin Democratic Party issued a statement decrying what it said was a “misleading” mailer by Frugoli. “The mailer features the phrase, ‘The Only Democratic Candidate’ in large bold font followed by ‘Endorsed by Every Former Marin County DA’ in a much smaller font,” according to the statement. Frugoli has sent out at least two flyers labeled as Democratic voter guides that list her as the recommended candidate in the district attorney’s race. 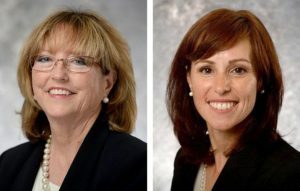 “Although there is a fine-print disclaimer noting that these are not official party endorsements, these mailers are a clear attempt to confuse voters regarding the Democratic endorsement for the DA’s race,” Pletcher wrote in her email. Pletcher notes that Frugoli has also dispatched a “Latino Voter Guide” and “Senior Voter Guide” that list her as the preferred candidate. According to Pletcher’s campaign manager, Ross Green, during the primary Frugoli’s campaign paid $22,496 to voter guide companies producing slate mailers. Pletcher said that she has made her voting record and party affiliation public; Frugoli, a Marin County deputy district attorney, has not. Charles said releasing Frugoli’s voting record public would have resulted in her address being made public. Pletcher, however, challenged that explanation. The Frugoli compaign countered that Pletcher spent most of her career as a federal prosecutor for the U.S. Department of Justice Antitrust Division. Following the court decision that allowed Pletcher to include the information about her Democratic Party endorsement in her campaign statement, Frugoli requested that Marin County Registrar of Voters Lynda Roberts correct some statements her office included in its court statement. According to that court statement, Charles first registered a complaint about Pletcher’s campaign statement on Aug. 17. The registrar’s court statement went on to say that it wasn’t until Aug. 21, a day after the 10-day window for the filing of writs challenging candidate statements had expired, that Charles notified the registrar’s office that the endorsement would disclose Pletcher’s party affiliation; the Marin Democratic Party’s bylaws require that all endorsed candidates be party members. According to Frugoli, however, Charles actually registered his initial complaint on Aug. 13, and was led to believe that Pletcher’s candidate statement would be corrected. Frugoli said Charles discovered the registrar wasn’t planning on challenging the statement on Aug. 20 when he called to ask if any concerns had been raised regarding her statement. Frugoli said Charles told the registrar’s office on Aug. 20, before the deadline, that according to the California and Marin County Democratic bylaws only party members can receive the party’s endorsement. Roberts, however, declined to amend her statement.